At Movie Churches, we often note that we don’t review movies but rather the churches in movies. So I don’t need to mention that it may well be one of the worst Christian films I’ve ever seen. I should, as usual, be writing about the clergy and the churches in the film, but there are no churches in God’s Club. Maybe I shouldn’t be writing about it at all, but this annoying piece of socalled film took 90 minutes of my life that could have gone to, say, three episodes of 30 Rock before it leaves Netflix. I want to get something out of the unhappy experience. Besides, the reason there is no church in the film is so strange, it provides the one compelling reason to write. They’re headed for a school board meeting that will be discussing whether Mrs. Evens should be allowed to have a Bible Club -- a Christian club called “God’s Club” -- at the high school. Both Mr. and Mrs. Evens are teachers at the high school, and everyone on the school board agrees there is no legal way to prevent the club. But the debate in this incredibly badly run meeting continues anyway. (The actual law about Christian clubs on public school campuses is a little more complex than the movie portrays it. In the last few years, the Christian organization InterVarsity was barred from California State and UC system campuses because they had the audacity to require Christian leadership for a Christian organization.) Back to the movie, where many parents are vocal about their disapproval of religion in any form having a place on school grounds. On the drive home, the Evenses talk about the club, with Mike still saying it isn’t “my thing.” Mrs. Evens argues it’s the only way to help the troubled youth in the school. They joke and laugh and then unfortunately decide to smooch while driving. This leads to a deadly accident, and (spoiler) Mrs. Evens doesn’t survive long after the crash. 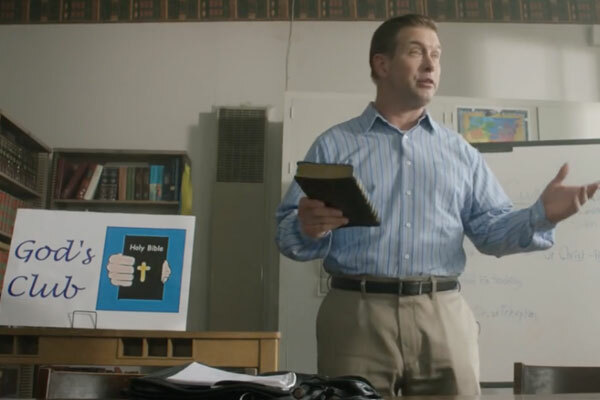 So, after three months of mourning at home, MIke returns to school and starts God’s Club on his own. I’ve been involved in Christian clubs at schools from my own high school years through my years as a pastor, so I’m familiar with some of the laws and regulations involved. One of those stipulations -- mentioned in the film -- is that the school can not be seen as sponsoring or endorsing the club. This has usually been interpreted as barring faculty from leading such a club. School staff can provide some supervision, being present in a classroom during club meetings, but usually not formal leadership. 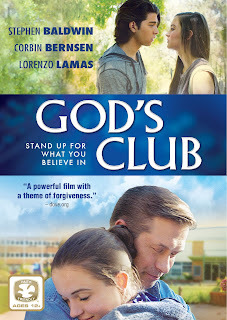 In this film Mike leads the club (and does it remarkably badly, especially considering he’s a teacher by profession). During an event when students are encouraged to sign up for clubs, Mike and his daughter, Rebecca (Bridget Albaugh), sit behind a sign-up table for God’s Club (there are also tables for drama, chess, and hiking clubs). A couple of students sign up for the club, supposedly to sabotage it, but they make no serious attempt to do so. We were disappointed. During that meeting, one of the boys makes a truly astounding statement. He says that there are no churches in the town where they live. This is just bizarre. From our travels, and even actual research, I can state quite confidently that any town large enough in the United States to have a high school, has at least one church, and most probably several churches. In 1880, George Walser founded a town, Liberal, Missouri, that was supposed to be an Atheist Utopia, which would be church free. But that dream didn’t hold long. Christian missionaries soon came to plant churches in the outskirts of town, and soon there were churches in the town itself. At the next meeting of the club, Mike hands out rather ugly t-shirts emblazoned with a “God’s Club” logo and illustrated Bibles. (“Sick! A comic book!” one of the boys exclaims. “No, it’s a graphic novel,” says another.) But again, Mike presents an incoherent message. Mike and his daughter don’t seem to know Scripture very well, except for citing the occasional verse. They don’t even seem to be familiar with Jesus’ command to turn the other cheek. Both father and daughter are egged into throwing the first punch in fights. Hardly the example that is going to win over a school and town. The worst bit of theology is expressed by the daughter toward the end of the film. Vic is a troubled kid, who has been prescribed Prozac and other drugs to deal with his depression and suicidal tendencies. He begins a friendship with Rebecca and begins to read the Bible. He talks about these things with his therapist. His therapist tells his “studies show many people have been helped by reading the Bible” but also warns him that “Christian girls wait for marriage”. At the climax of the film, Vic is considering suicide and Vic’s father (Lorenzo Lamas) blames Rebecca for discouraging his son from taking his meds (she didn’t). Vic runs off, and Rebecca finds him about to jump off a bridge, and Rebecca tells him, “If you kill yourself, you can’t go to heaven. It says so in the Bible!” Now the Bible says no such thing. There has been debate about the eternal fate of suicides for centuries in the church, and the reason there has been debate is because there is no handy verse to point to with a clear cut answer. Rebecca’s proclamation is bad theology and even worse counseling. Mike creates controversy in the town and wrecks much havoc by insisting on starting a Christian club on campus when he could accomplish what he wants to accomplish by starting a Bible study in his home. What Echo Grove really needs is a good church, but I’m giving God’s Club on the high school campus just one steeple. Well done. And dare I say yet another reason I dislike Christian movies for the most part... oops... said that out loud. Thank you for saving me the agony of sitting through it. Thanks, Jennifer. Most Christian films are pretty bad. But I actually watched one last night from Pure Flix, often the worst offender, that I liked. I'll be writing about Case for Christ in November.